Anyone who has ever talked to a Japanese person about Japan, read about Japan, or visited Japan has heard that statement. It’s a statement that can cause one to roll her eyes, arguing that the entire world has four seasons. But in Japan, the seasons are revered, with much fanfare associated with the arrival of each new one. Autumn is no exception. In fact, the day of the Autumnal Equinox, which was September 22 this year, is a national holiday in Japan known as Shuubun no Hi (秋分の日). At the “Conversation Café” run by the Japan Foundation and hosted by The Nippon Club, the theme was Japan’s Autumn (Nihon no aki – 日本の秋). Some of the special activities the Japanese do during the fall include grape gathering (budougari – ぶどうがり), chestnut picking (kurihiroi – 栗拾い), sweet potato digging (imohori – いもほり), and maple viewing (momijigari – もみじがり). On a recent trip to Japan, JapanCulture•NYC was on the lookout to discover these examples of how Japan welcomes the fall and significant holidays, as told by language instructor Yoko Sakurai of the Japan Foundation. While we didn’t actually participate in chestnut picking or maple viewing, we saw many examples of both, as chestnuts and maple leaves adorned store fronts throughout Japan, especially in Kyushu. 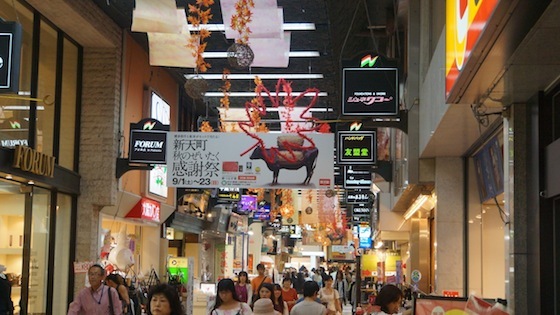 This shopping arcade in Fukuoka welcomes the coming of fall with festive arrangements of maple leaves and chestnuts, as well as giving a nod to “autumn’s luxuries” (aki no zeitaku – 秋のぜいたく). 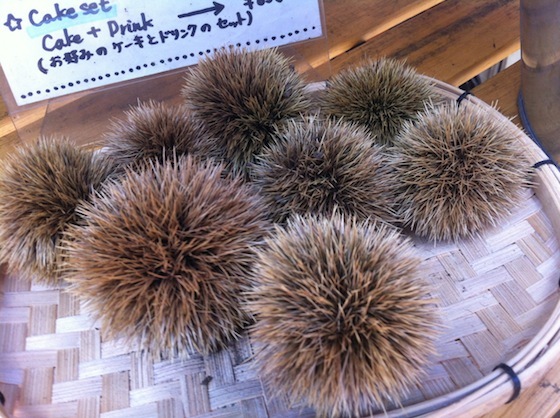 This storefront in Ueno’s Ameya Yokocho shopping arcade in Tokyo displayed chestnuts . 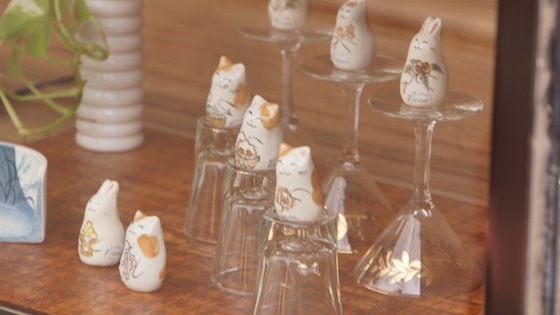 . .
And these adorable rabbits and cats sate in a store window in the Tokyo neighborhood of Yanaka. Each figure is holding something related to fall: The rabbit on the bottom left has mochi (rice cakes), while the nearby cats have grapes, chestnuts, mushrooms, and an autumn fish (probably a sanma or a saba). 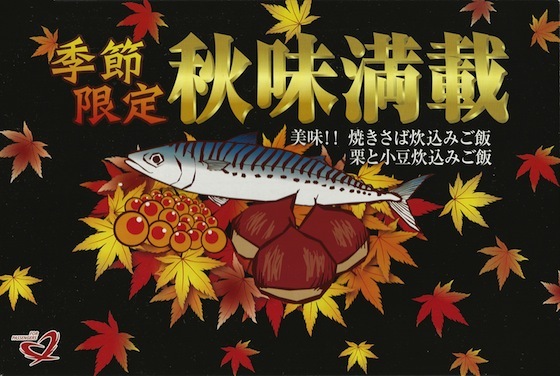 Speaking of fish, the phrase “autumn of appetite” or “an appetite for autumn” (shokuyoku no aki – 食欲の秋), was taught to us at the Conversation Café. The Japanese pay particular attention to seasonal ingredients, and as fall approaches, they begin using certain fish and vegetables in their cooking. I was fortunate to find a lovely autumn-themed eki ben (station bento) at the Hakata Station in Fukuoka. 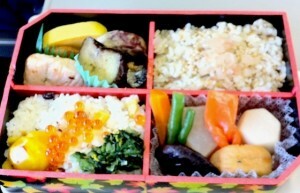 It contained yummy fall foods such as Japanese mackerel (saba), salmon roe (ikura), rice with chestnut chunks (kurigohan), and seasonal vegetables. We were also in Japan on Respect for the Aged Day (keirou no hi – 敬老の日), a national holiday that occurs on the third Monday of September. Dating back to 1947, Respect for the Aged Day originally was observed on September 15, and it was declared an official holiday by the Japanese government in 1966. It’s a way to honor longevity, a trait for which the Japanese are famous. A recent article in The Wall Street Journal Japan reports that the number of Japanese over age 100 is now at 50,000. To honor all of those centenarians – as well as Japanese people over age 65 – children give special performances and people deliver bento to nursing homes. The Japanese media discuss topics affecting the elderly and interview the oldest people in the country. Currently the oldest person in Japan is Jiroemon Kimura of Kyoto, who was born on April 19, 1897, making him 115 years old. There is so much to celebrate in Japan during the fall, with several festivals; moon viewing events (which are just as important as cherry blossom viewing in the spring); Health and Sports Day (taiiku no hi – 体育の日) in October, encouraging children to lead active lives; and Shichi-go-san (七五三), a day of prayer for children in November. What will you do to celebrate fall in New York? Next Next post: The Last Japan Block Fair Approaches!